Colorado Springs, Colo. – The radio broadcast that defied expectations is marking 25 years of capturing the hearts of young and old alike. Adventures in Odyssey (AIO), Focus on the Family’s radio drama about big personalities in a small town called Odyssey and its ice cream emporium named “Whit’s End,” aired its first episode on Nov. 21, 1987. Many were skeptical this venture would be successful in the age of television, movies and other visual entertainment. But the show proved the critics wrong and took on a life of its own. For a quarter of a century, AIO has been a staple for millions of families the world over – it airs in 45 countries, and in three languages: English, Spanish, plus a live action television series in Hindi. AIO reaches more than 2 million households each week, airing on 2,115 radio facilities in the U.S. alone, as well as being streamed online. More than 20 million CDs and cassettes have been sold worldwide. The series also spawned 17 videos, nearly three dozen novels, video games, music albums and more. AIO is one of the longest running radio dramas in history: If you listened to Odyssey from the very beginning, it would take 12 days, six hours, 51 minutes, and 19 seconds to reach the latest episodes. Fans can even visit Whit’s End, the popular ice cream shop from the series. Focus’s Welcome Center, which receives an estimated 250,000 guests from all 50 states and more than a 100 countries every year, houses an award-winning indoor play area dedicated to AIO. The interactive experience offers a recording studio where children can perform their own AIO episode; a three-story slide, A-Bend-A-Go; a puppet stage; Whit’s End Soda Shoppe; and free birthday party rooms where more than 450 celebrations were held in 2011. Leon Wirth, executive director of Parenting and Youth at Focus, isn’t surprised by the devotion children and adults alike feel towards AIO. To celebrate its 25th anniversary, AIO is hosting a live show on June 16 in Dallas, Texas. Eight of the main characters will perform a new adventure on stage before an audience of thousands. AIO is also launching “Get in the Show,” a talent search contest for children ages 6-15. Hosted nationwide at Family Christian stores this July, the contest will give kids a chance to audition for the show. The winner will be part of AIO’s Volume #58 in 2013. Christian recording artist Phil Joel has also written a song, “Get in the Show,” especially for the festivities. 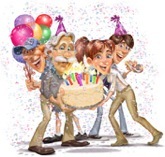 To learn more about Adventures in Odyssey and its anniversary, or to coordinate a media interview, contact Carrie Kintz at 719-531-3312. Reaching about 238 million people in more than 130 countries, Focus on the Family is a global Christian ministry that helps families thrive. We provide help and resources for couples to build healthy marriages that reflect God’s design, and for parents to raise their children according to morals and values grounded in biblical principles. Visit Focus online at www.focusonthefamily.com.